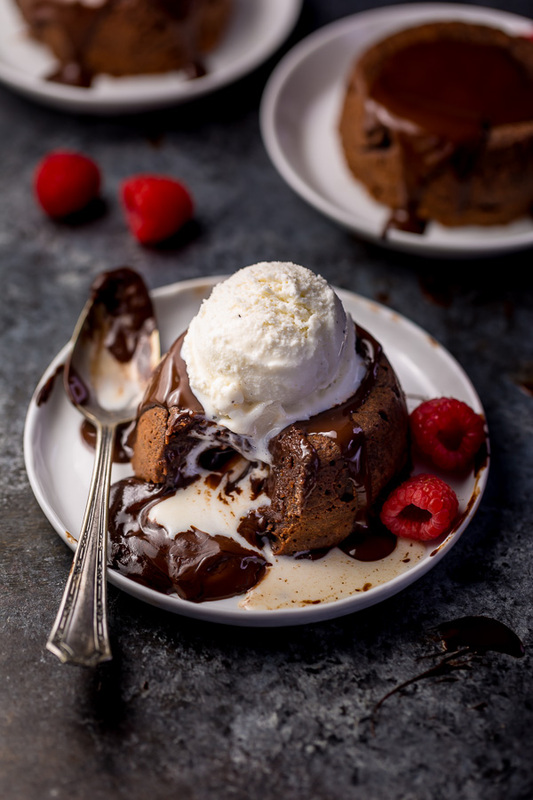 Grand Marnier Molten Chocolate Cakes are rich, decadent, and so delicious! And you won’t believe how easy they are to make! 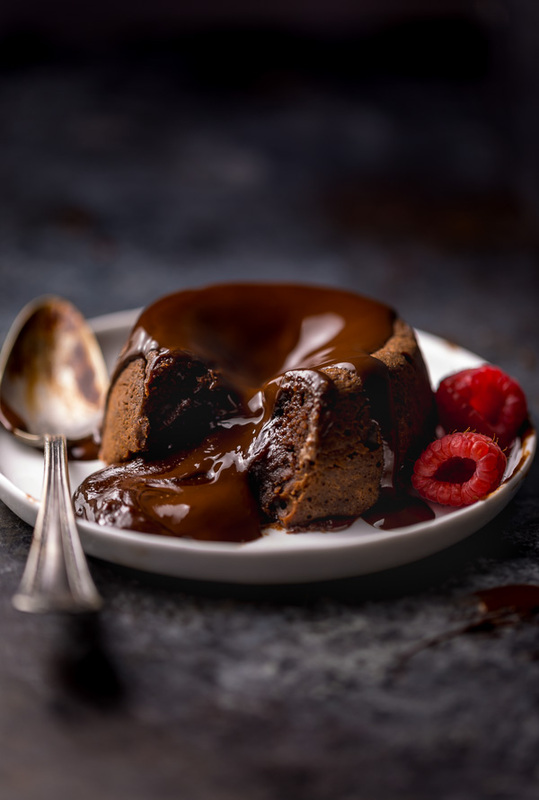 My 31st birthday was a few weeks ago and this year I decided to skip the traditional birthday cake and make Grand Marnier Molten Chocolate Cakes instead. After baking the cakes I realized we only had a few tablespoons of Grand Marnier left in the bottle so I made some Grand Marnier Truffles, too. Because you can never have enough chocolate, right?! So why did it take me so long to share them with you? Well, it’s been a wild and crazy month! We were in Boston the days leading up to my birthday and then on Nantucket Island for my actual birthday celebration. And while we were there… I GOT ENGAGED. If you follow me on Instagram, you probably already know this because I’ve been blabbing all things wedding over there recently. So I’ve been on cloud nine planning my dream wedding and creating some wedding inspired desserts for you. I also caught some crazy Summer flu, but I’m on the mend – FINALLY – so here we are. All caught up and ready to eat cake! More specifically, this gooey and glorious Grand Marnier Chocolate Cake! 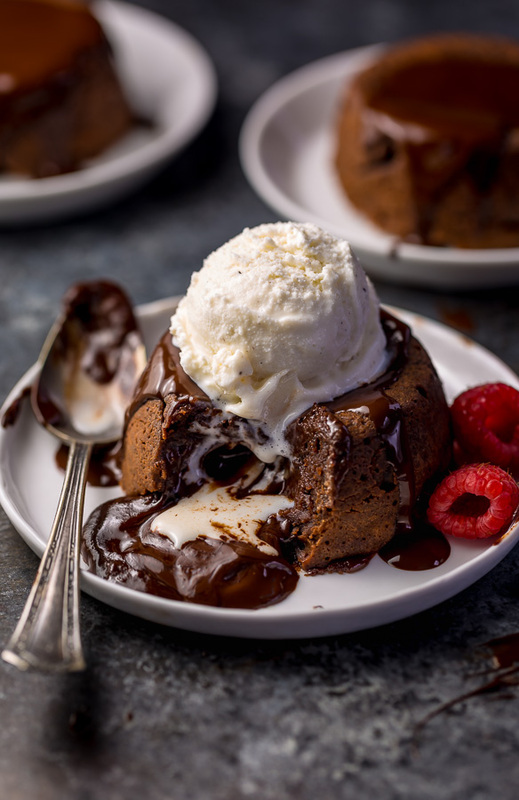 Have you ever made molten chocolate cakes before? Also known as lava cakes. This was my first rodeo with them and I have to admit I was REALLY nervous. I assumed they would either explode in my oven or stick to the ramekins when I tried to remove them but guess what? Neither of those things happened! And honestly I feel so silly for fearing this recipe because it’s so easy. But more importantly: it’s so delicious! My soon to be husband couldn’t believe I made them in less than an hour. And all of my friends who tried them said they taste a million times better than the ones they’re used to eating in fancy restaurants. Moral of the story? 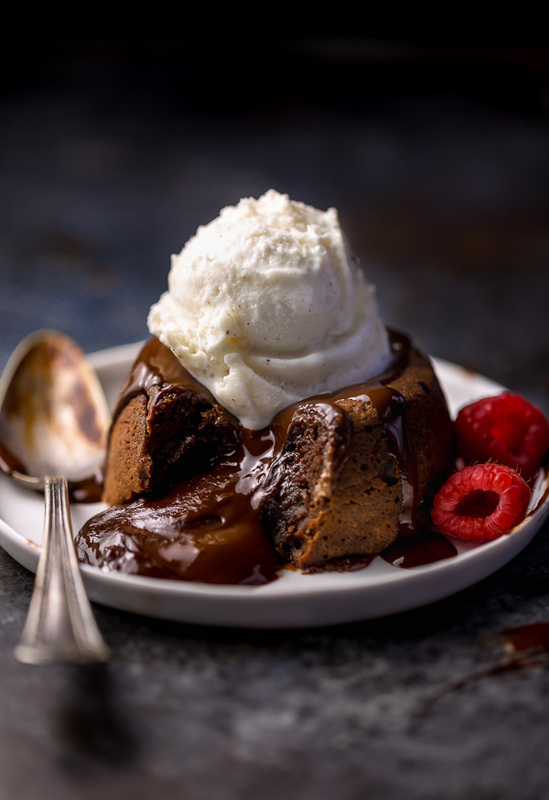 These Grand Marnier Molten Chocolate Cakes are basically foolproof and loved by all! Grand Marnier makes this already special dessert extra fancy. And if you’re not familiar with Grand Marnier, allow me to introduce you to this delightful orange-flavored liqueur! Because I have not tested this recipe without the liqueur, I cannot say whether or not it will work without it. In order to amp up the orange flavor, you’ll also need a 1/2 teaspoon of fresh and finely grated orange zest. Feel free to omit this if you’re not huge on orange flavor, but personally I love it. You’ll need four 6-ounce oven safe ramekins for this recipe. I use and love these. Because every oven runs a little differently, you’ll want to keep an eye on your cakes as they bake. Pull them out when they’ve puffed up but are still a little jiggly in the middle. And finally, be sure to only cool the cakes for exactly one minute before turning them over and removing them from the molds. Otherwise they’ll continue cooking and could stick. Oh, and I almost forgot to mention the BEST part about this recipe, which is it can be made ahead of time! Up to 12 hours. So you can make the batter the night before and bake these beauties up for a decadent brunch treat. Or whip the batter up before work, and bake them up as a delightful dessert! No matter what time you bake them, I’m confident you’ll love them. Preheat oven to 450°F. Spray two 6-ounce ramekins well with nonstick cooking spray and place on a baking sheet. Set aside. Add the butter and semi-sweet chocolate to a large microwave safe bowl and microwave in 20-30 second increments, making sure to stir well after each increment, until melted and smooth. Remove from the microwave and whisk in the powdered sugar until well combined, then add in the egg, egg yolk, and vanilla and mix until fully combined. Add in the flour and espresso powder and mix until just combined, making sure not to over mix the batter. Evenly divide the batter between the two prepared ramekins. Bake at 425° for 12-14 minutes or until the edges are firm and the center is slightly soft. Remove from the oven and allow to stand for 1 minute. Carefully invert each ramekin onto a small plate, serve, and enjoy! 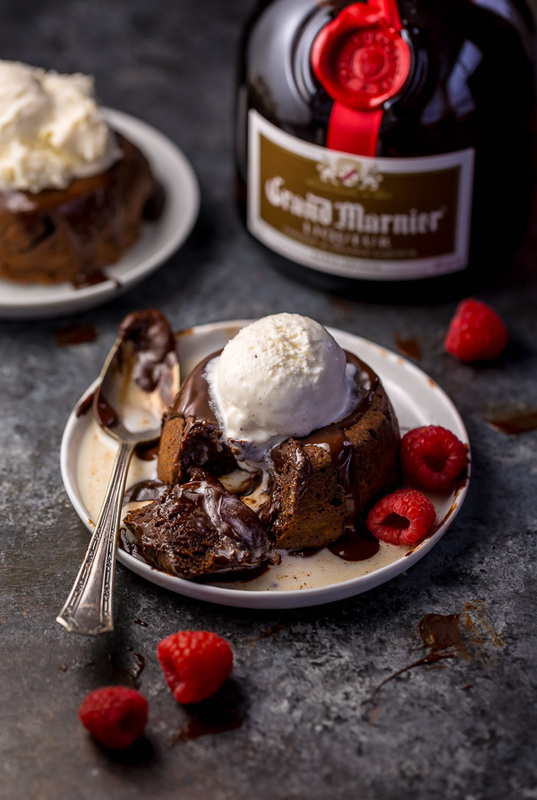 Grand Marnier Molten Chocolate Cakes are rich, decadent, and so delicious! And you won't believe how easy they are to make! Preheat oven to 450°F. Generously grease four 6-ounce ramekins with butter OR nonstick baking spray; place on a baking sheet and set aside until needed. 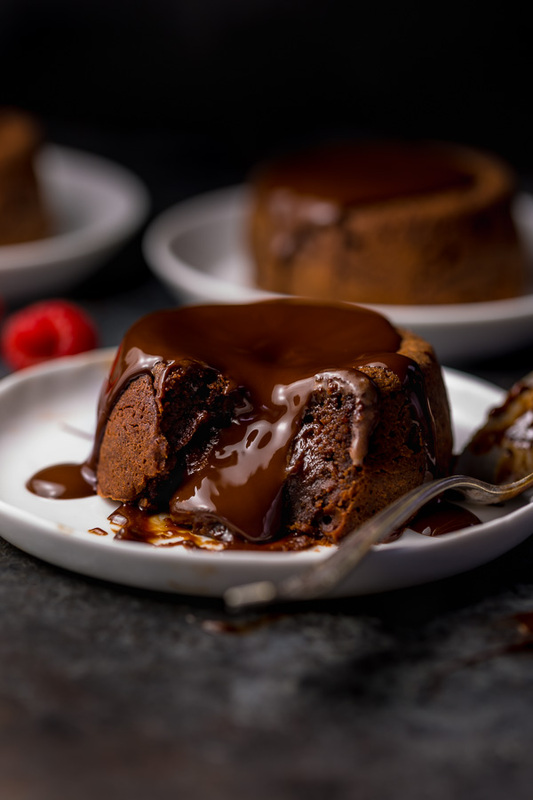 Add the butter and semi-sweet chocolate to a large, microwave safe bowl and microwave in 20 second increments, making sure to stir well after each increment, until chocolate is completely melted. Remove from the microwave and whisk smooth. Whisk in the powdered sugar, stirring until well combined. Add in the egg, egg yolk, Grand Marnier, and orange zest and mix until well combined. Toss in the flour and salt and mix until just combined, being sure not to over mix the batter. Evenly divide the batter among the prepared ramekins and place them back on the baking sheet. Bake for 11 to 12 minutes, or until the tops have puffed up and the edges are firm but the center is still slightly jiggly. Remove from the oven and cool for exactly 1 minute. Using a tea towel to protect your hands, carefully invert each ramekin onto a small plate. 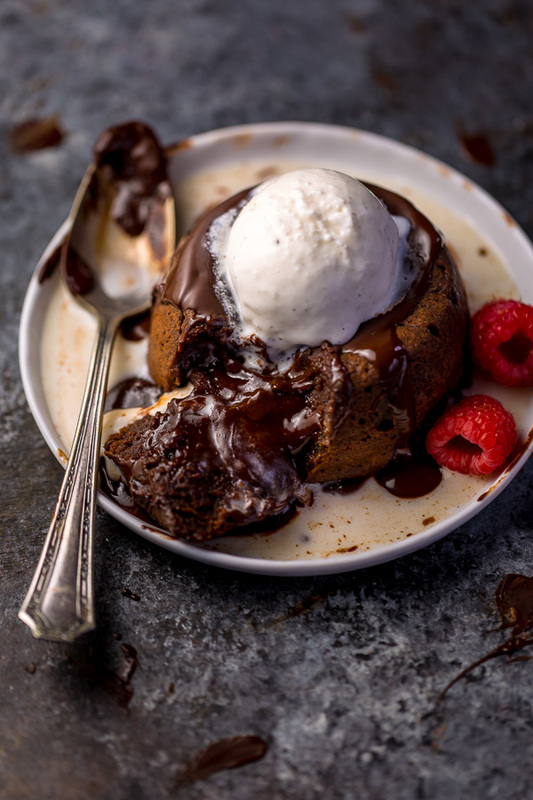 Top with chocolate syrup, ice cream, and berries, if using. Serve at once and enjoy! Congratulations on your engagement! Our wedding was two months ago and I had the best time ever wedding planning! good for you,I love looking bot I don’t do it very well. Congratulations!!! All the best to your and your fiancé! By the way, as I live in Australia (in the tropical far north, Great Barrier Reef territory! ), it’s currently fall/winter here, so pumpkin recipes sound just lovely! But, I must admit, our “winter” is kind of, not really that cold (80f or 27c today!). Still… it’s cold to us!!! Once again… CONGRATULATIONS!!! Does anybody know if this will work without the Grand Marnier?